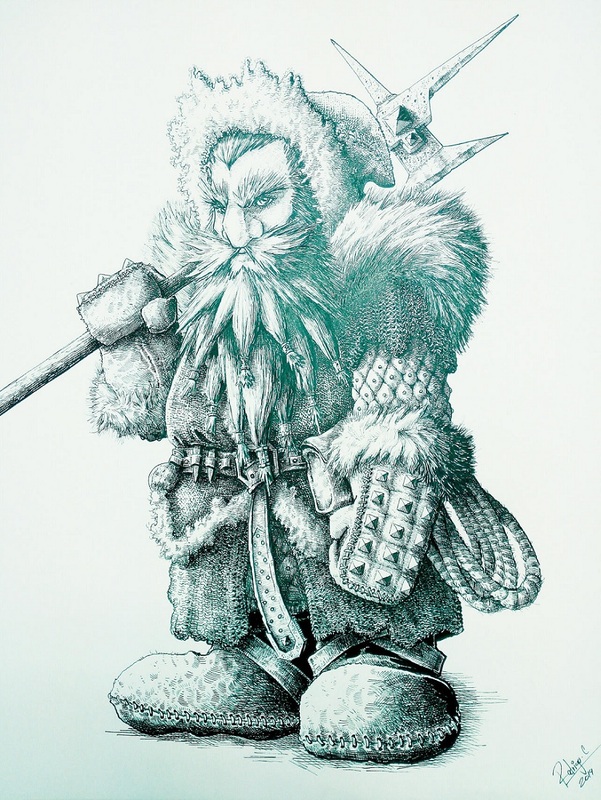 Ladies and gentlemen, do you agree that we gotta have Inuit Dwarves for the Ninth Age? Thickly built Dwarves are well suited to survive in extreme environments, not least by the craftiness of their hands and minds. 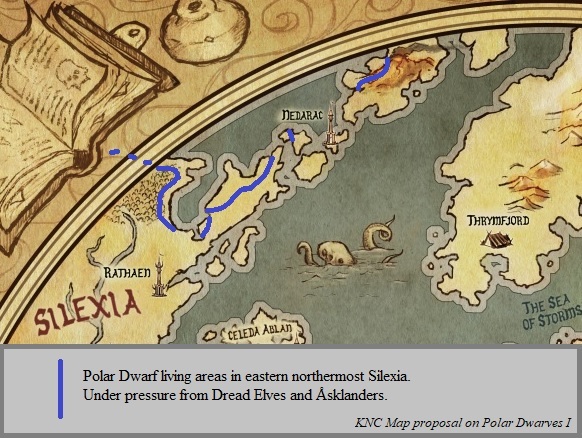 Polar Dwarves are to be found in the inhospitable climate of remotest Silexia to the far north. They are great hunters and fabled traders of ivory who seldom encounter people from the outside world. This warrior is armoured in bone lamellar with laminar back "wings" for rear protection. Note snow goggles. Stiffbeards: Renowned Craftsman, they make their homes in ice caves on the vast frozen lands up north, starting around the ice bay of Forochel and all the way down in between the mountains of Angmar and the grey mountains (Ered Mithrim). Very secretive and peaceful, they avoid taking part in any troubles from the outside world at any costs. Despite their secretive ways, they are also accomplished merchants, and regularly travel vast spans of the frozen lands to trade with many diverse cultures. The items they create from exotic materials such as Ivory and bones from sea monsters are very sought after, in particular their fabled toys. Stiffbeards are ultimately free spirits, lovers of music, stories and the tribe above everything else. I'll have to be brief for the moment being. Please share your thoughts, ideas and criticism. 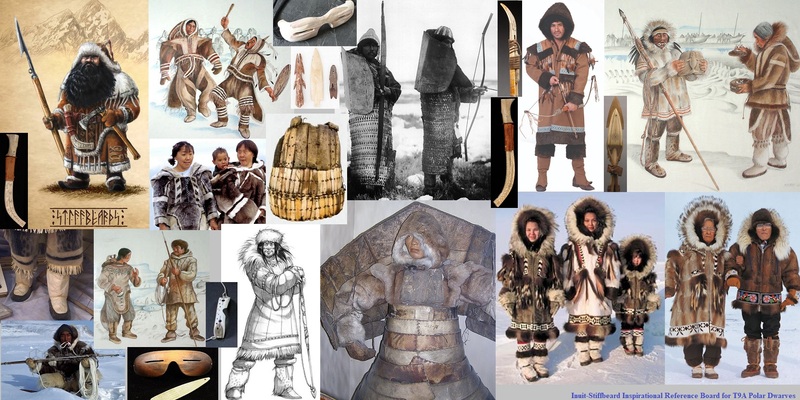 There are a lot of fertile historical and mythological material to tap into for brainstorming about Eskimo Dwarves, and of course wacky fantasy potential in general for the Arctic region. Its a good concept, but the tools and weapons are too primitive,remember these are dwarves. I think you can make this work. I think dwarves need four things, technology, axes, beards and live underground. Within those four guidlines you can do whatever you like. They'd need some iron and coal mines, however fringe. And big ice caves. They could have inukshuk stone war golems. Normally the Inuit would build inukshuks as land marks so they could find their way, so maybe the inukshuk golems could guard and mark important roads or paths belonging to the polar dwarves. They could be monstrous or human sized depending on the stones they are built with. I'd love some location shots of massive ice caves. That sounds really great. I'm okay with primitive tool using dwarves myself. Not all of them need to be technology genius'. The Lord of the Rings dwarves don't really have quite the same emphasis on technology and I think they work fine. @Gankom: Certainly something to thrill the imagination! On future to-do lists. Agreed, some Dwarves can be low-tech, no problem. They're still all about fine craftsmanship. 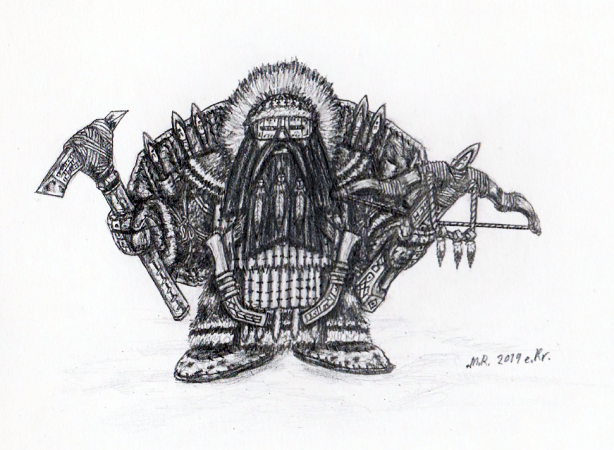 Artwork by DracarysDrekkar7, being an Inuit fantasy Dwarf concept for the Karuits of Remotest Silexia of the Ninth Age. This artist has a deft hand at illustrating fantasy, capturing both an impression of rugged life and craft refinement in fine detail. Here we have a possible sidetrack of development for our Polar Dwarves: They remain an open question. "Ooooh can we have polar bears with tusks, pleeeeese! .........and ice golems......giant scary walrus ice golems........ and penguins (I know they are southern hemisphere, but I like them), giant penguins er just because. Tiny hairy snotling slaves riding giant artic foxes as scouts, messengers, cleaners, cooks and food if it gets too cold. Sleds pulled by white wolves (with bony spikes all over it). More penguins. I think I should go to work before I get too excited." I’d only just finished this fluff for the polar ones. The Khinqwit dwarves of the far north claim to be the oldest of the free races. They are certainly one of the hardest. They call themselves ‘the people’ and regard all others as enemies and slave races. Their myths go back to a time long before the sky hammer, hen their saurian slavemasters first took them to the mountains of the north to toil for the metals and gems they coveted. Stories tell of repeated slave breaks. How bands of desperate dwarves would force or tunnel their way to freedom. How the saurians would hunt them down, drag them back and butcher them in front of their comrades. The myths also speak of Hakhawazharr of the Hard Path. Their first leader and founder of their race. They tell of his great escape with a large part of his people. They tell of how he planned it for mid winter when the saurians would be at their most sluggish. Hakhawazharr led his people north hoping to escape the pursuit. He chose the highest passes, the coldest tracks, the hardest paths. The saurians disabled by the cold sent their hunters, trusted slaves trained in the recapture and execution of escapees. Bartered by the weather, harried by the hunters Hakhawazharr led his people ever northward, seeking for the Shackleless Land. The Shackeless Land where they would be free. The Shackleless Land where their enemies would not, could not follow. The Shackleless Land where only the hardiest, only the hardest could survive. Trust not the Lizard, he will enslave you. Trust not the Elf, he will ensnare you. Trust not the Green of Skin he will savage you. Trust not the Manning, he will betray you. Trust not your weakling brethren, they will seek to profit from you. Trust only in the people, they will save you. The people of Hakhawazharr took his words as stone and turned their faces from the sun. Northwards they went till they reached the Shackleless Land of ice and snow where no Lizard could and no Hunter would follow them. Into the white desert they went trusting to the words of Hakhawazharr. Builders that they were they cut blocks from the ice and snow and huddled inside whilst hunters searched for sustenance in that white desert. Yet even with the meagre food they would have perished were it not for the first Shaman, Azthrogeh. It was he who went into the blizzard that night. He went to sacrifice himself. He went so there would be more food for the others. He went to find peace. He found fire! None know the truth of it. Or none will tell, for it is one of the great mysteries of ‘the people’. Yet it is said that Azthrogeh found the ‘Eternal Flame’, and that this entity that the people revere as a god taught Azthrogeh the secrets of sorcery so he might bring warmth to ‘the people’s side they might live. Little is known of the religion of the Khinqwit, for it is taboo to write the truths down and punishable by death to reveal them to others. That they worship fire in some form is known. Yet unlike other races they do not use it in warfare. Fire is regarded as a sacred thing and to knowingly extinguish a flame is a great sin. That they have magics to create and maintain fire is also known but they would never ‘bless’ an enemy by bestowing this gift upon them. That their god requires blood is also known only too well by those unfortunates who have the misfortune to fall into their grasp, The north is a hard place and it breeds a hard people. Weakness is death, pity is weakness, only the strong survive up there. By reason of their geographical position and self imposed isolation the Khinqwit dwarves of the North developed separately from others of their kin. This and the sheer lack of mineral resources mean their technological level is far behind most races. This has led many to foolishly and indeed fatally underestimate them. Their animal skin clothes serve not only to keep them warm but provide remarkable protection. This is thought to come from the many small symbol carved ivory and bone charms stitched carefully into them. These are thought to provide both increased warmth but also magical protection. 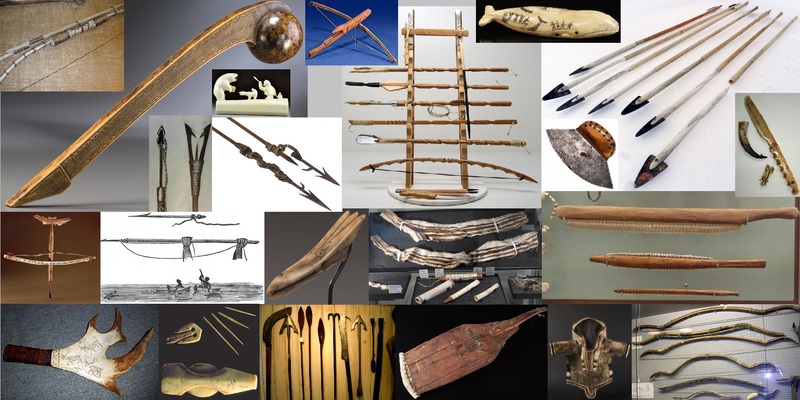 Similarly the long ivory knives and short bone spears should by all rights shatter against the armour of more modern cultures. Yet just as water can be hard as iron when frozen so these symbol carved weapons have a strength and sharpness well beyond that which they should. Woe betide the foe who comes across one of their leaders with bartered or stolen metal weapons! These are bedecked with charms and symbols rendering them truly terrifying in combat. Many Khinqwit carry short bows of surprising power. 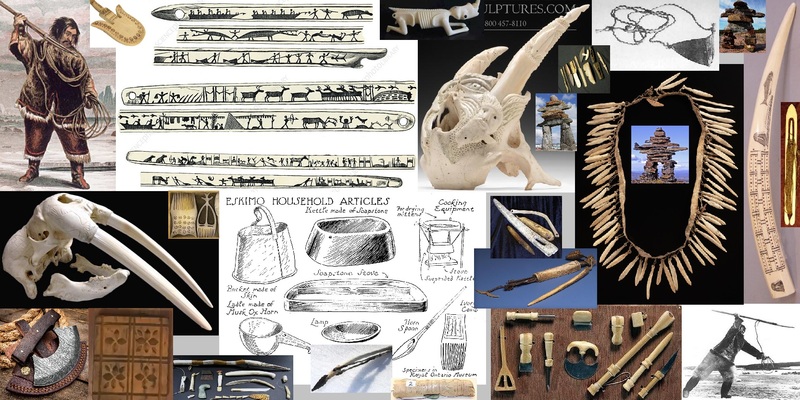 These symbol carved bone and sinew creations fire barbed shafts of bone with deadly accuracy over short distances. Worse still the tips are coated with some unknown poison which chills the blood of the victim. This will often kill smaller victims with just a scratch and several hits will slow even the great giant walruses that frequent the icy shores. These ‘backward’ dwarves have been forced to find other ways than technology to survive and as such are possibly the most accomplished of all their kin in the mtstic arts. Each group of warriors or hunters will contain a shamatheh, a lesser shaman. These shamatheh draw on the combined power of the charms in the group to weave a storm of ice and snow round them to hide them from missiles and chill their enemies. With enough warriors gathered together the shamatheh can direct blasts of icy shards at their enemies. The full shamen, the shamanatheh can whip up blinding snows or devastating ice storms, where lumps of ice as big as a helmet can crash to the ground pulverise their enemies. However the greatest weapon of the Khinqwit is their ferocity. Warriors have been known to fight on with horrific wounds driven by a frenzy of hate.